On June 18th of this year, Salt Lake Police were engaged in a search for a missing boy. During the search an officer shot a Weimaraner that was in a person's backyard. There was a huge outpouring of rage over the shooting followed by support and demands for a change in the callous policies police have towards dogs. The site Justice for Geist is campaigning for change. When Darrien Hunt was shot in Saratoga Springs, I was expecting a similar response. Instead I've encountered really strange reactions. So, I've spent a good part of the last two days following Utah social media and talking to people about the shooting. Outside immediate friends and relatives, I've discovered that most people have not heard about the shooting. Those that have heard of the shooting generally repeat the official talking points with statements such as: "Darrien Hunt? is he the black guy who attacked police officers in Provo? Utahans who've started researching the issue seem to be concluding that the shooting was justified. I don't like recounting private conversations. Here is a public post by Semperfivirens made on on The Guardian which seems to reflect Utah sentiment. They guy [Darrien Hunt] obviously should have been committed to a facility by his family. They didn't and instead chose to cherish his child-like nature. A child-like nature that involved threatening people with a samurai sword. The general opinion appears to be that Darrien deserved what happened. Semperfivirens is saying that the shooting is the fault of the mother. I agree with the statement that we should wait until after the official investigation before making any judgments about the police officers in the case; However, comments about the reporting of the event, the fantasy role playing culture in Utah, and about the direction of the investigation are appropriate. For example, I've been trying to point out that a large number of people engage in costume play in Utah County. Others are discussing Utah's lax open carry laws. If many are engaged in open carry and many people are engaged in costume play without being confronted by police, then this information is relevant. Much of the conversation in Utah is focusing on the fact that Darrien had been arrested earlier this year. The Guardian was displaying this mugshot. The Guardian cites Darrien's aunt Cindy Moss who claimed that Darrien was jumped at a drinking party and that he was the only one arrested at the event reportedly because he was the only one over 21. 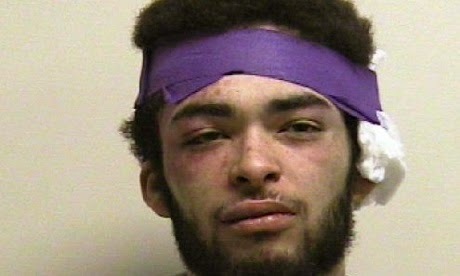 The mugshot shows a bandage and Darrien's face appears roughed up. Hopefully the police have photos of the other kids in the fight. But back to my original sentiment. There appears to have been more outrage in Salt Lake over the shooting of a dog than the shooting of Darrien Hunt. I just heard about it this week! While stopped at a Subway in Santaquin, I saw something in the local news. I had never heard a thing about it. And it struck close to home, because when my son was in his mid teens, he was fascinated by Japanese culture, began collecting samurai swords, and while he never ran around a mall with his sword, he did hike in the hills with a sword and staff, boots and long coat. To imagine him being shot in the back for being a kid... horrifying.